How about pristine, 65mm footage that’s only recently been discovered? How about Neil Armstrong’s descent down the LEM ladder and onto the lunar soil from a different angle than the one we’ve always seen? How about a clear version of Armstrong’s “small step” announcement, straight from the NASA feed, without any TV anchors reacting or interrupting? How about previously unseen footage from launch tower cameras, as well as inside the stages of the engines as they separate? 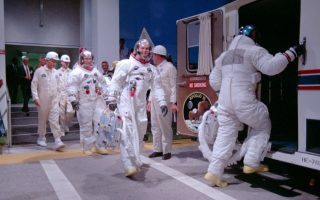 They’re all here in “Apollo 11.” There are split-screens, too, particularly when techs found a hydrogen leak a few hours before launch and we see them inside the tower tightening bolts and making repairs without affecting the countdown. Would they fix the problem in time for the mission to proceed? Of course, we know the answer, but I was still caught up in the tension of that moment, as well as other critical junctures in the flight. Best of all, we get to see the moon in color. The lunar surface isn’t full of pastels and an earthly palette, but it’s not as gray as I’ve always thought. After all, the only way I’ve ever seen it is in the grainy black-and-white images of the television on which we originally watched that historic achievement, because NASA didn’t have the bandwidth at the time to send full-color video all the way back to Houston. And, oh, those glorious shots of the Earth in the distance! Director Todd Douglas Miller scoured thousands of hours of NASA film and audio to find the pieces he’s put together so brilliantly, and uses nothing but the original footage in the documentary. Miller says that he and his team had a rule: “If it didn’t happen on that day at that specific time, we’re not using it.” Thus, we get no one discussing the mission in the past tense, no historian explaining why it was so important, no family members sweating out each moment. Similarly, the music on the soundtrack by Matt Morton — which matches the action with a Moog-synthesizer-driven rhythm, was created only with instruments that existed in 1969. Miller has added clocks and graphics on screen counting down until various events: trans-lunar injection, LEM separation, and the thrilling footage from inside the lunar lander as it approaches the moon’s surface with just a few seconds’ worth of fuel remaining. He also includes scenes of the crew’s return and move into isolation for almost three weeks. Best of all, “Apollo 11” includes no narration, except for a few audio clips of Walter Cronkite (which may be from the original broadcasts, but sounds like it was from a later, scripted CBS special). Instead, we hear — in real time — the voices of various teams of professionals in mission control communicating with astronauts Armstrong, Buzz Aldrin, and Michael Collins, in all their technical jargon brilliance. As we approach the fiftieth anniversary this summer of the greatest scientific achievement ever, this “Apollo 11” documentary should be required viewing in every high school in America. Let it inspire the members of a new generation (as it did me) even if they don’t go into a STEM field (as I did not). Let them see the thousands of people who made it happen, using pencil, papers, and slide rules to move from task to task and ensure that their calculations not only got the crew to the moon, but back home safely, as well. Let them see the fascination on the faces of the tens of thousands who gathered — at Cape Canaveral, on nearby beaches, in a JC Penney’s parking lot, and the terrace of a nearby motel — all to watch history as it happened. Miller and his team have expertly condensed the eight-day adventure into 93 minutes of thrilling movie-making. I didn’t see “Apollo 11” in its one-week-only Imax run, but on a standard movie screen, where the scope of this undertaking is still as large as the mission itself. It will certainly be near the top of my list for not only Best Documentary of 2019, but the overall title of Best Movie, as well. I give “Apollo 11” a 9.5 out of 10.